We have multiple cameras, so please click here to view all our nests and join in the chat. 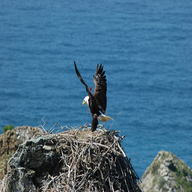 Nest Information: The West End bald eagle nest is located on a rock outcrop about 100 m above the Pacific Ocean at the western tip of Santa Catalina Island, California. Bald eagles were wiped out on Santa Catalina and the other seven California Channel Islands by the early 1960s because DDT pollution in the ocean off southern California caused them to lay thin-shelled eggs that broke before the chicks could hatch. The Institute for Wildlife Studies (IWS) began bringing bald eagles back to Santa Catalina Island in 1980 by releasing young eagles from hacking towers. When the first eggs were laid in the late 1980s, they all broke in the nest because of continued DDT contamination. From 1989 through 2006, IWS collected the fragile eggs from nests for artificial incubation, leaving behind fake eggs that the adults continued to incubate. Once chicks hatched they were raised in captivity for up to 2 weeks until they were ready to be fostered back into a nest. The adults continued to raise the chicks as if nothing had happened. As part of our research, we band the chicks when they are about 8 weeks old. This entails putting on a back-pack mounted radio transmitter, leg bands (for permanent identification) and patagial wing markers that allow us to identify a bird from up to a mile away using a spotting scope for up to 10 years or more. The West End nest has been active since 1991 and viewable online since 2005. From 1992-2006 there was a trio of eagles (2 females and a male) breeding together. Over the years there have been changes in the breeding birds present. The current female at the West End nest (#91) hatched at the Two Harbors nest in 2009. The male (#01, he has lost the top half of his wing tags) was produced by captive eagles at the Avian Conservation Center at the San Francisco Zoo and fostered to the Pinnacle Rock nest on Santa Catalina Island in 2000. This year (2016) will be the second breeding season for #91, who replaced the original West End female (a bird released in 1986 named Wray) in 2014. To find out what has been happening on this and our other nests, please visit the Channel Islands Live! Eagle CAM Discussion Forum.